Sorry to scream at you, but these might just be worth a good yell fest. C) that drizzle on top is ancho kissed, too. D) are you annoyed that I’ve said ancho kissed twice in a row? E) like, what is that even supposed to mean? F) I guess I’m trying to relay that they’re not over the TOP ancho-y, but just the right amount of ancho. G) so like, just ancho kissed. H) I don’t know what ancho means anymore, I’ve said it so much. I) all the toppings are prrrrrrfect together. creamy, crunchy, spicy, bright, ancho kissed. J) my hair is already growing. Don’t you just love crumbled queso fresco? There’s no way I express my love for that tender chunk of glory enough on this here internet URL website blog. I don’t think I’d prefer to live a single day without it. Its crumbly, moist (sorry) nature with its mild creamy flavor just slays meh dead. Of course you can use cheddar or anything you want if you can’t find queso fresco. But if you’re not familiar with it, I hiiiiighly recommend giving it a go! It will change the course of your Mexican food decisions for the rest of ever. These tacos are actually pretty simple to pull together, minus the little bit of topping prep work. 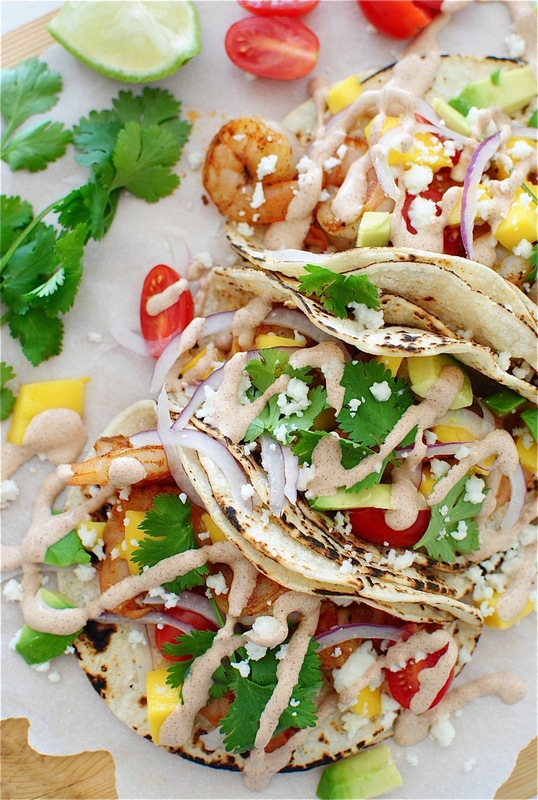 Get some extra hands to help you with the mango and avocado while you sear the shrimp. I had Will pit and dice the avocado while Natalie wrangled the mango seed. Just kidding, please don’t call Child Protective Services. But I will need you to make and eat these as soon as possible. Oh hey it’s TACO TUESDAY! Duh. Season the shrimp on both sides with the salt, pepper and 1 Tbs. 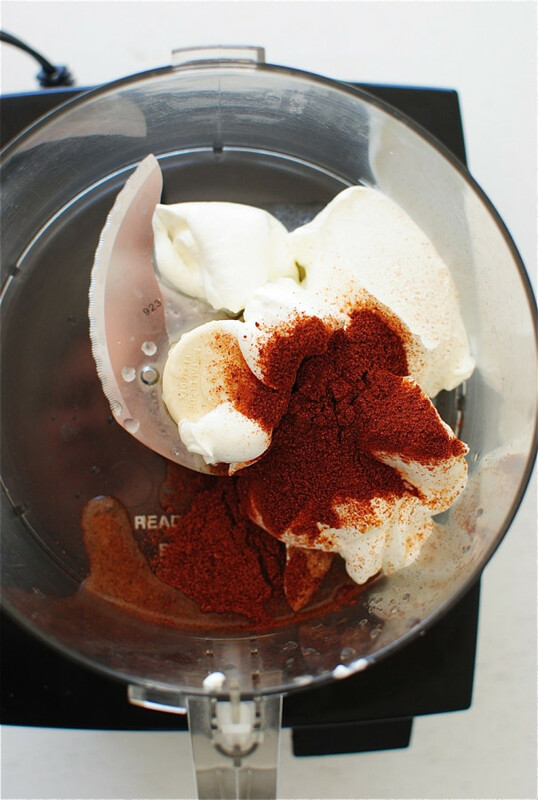 ancho chile powder. Toss to coat. Heat a Tbs. extra-virgin olive oil in a large sauté pan over medium-high heat. Add the shrimp in a single layer; sear on one side for one minute. 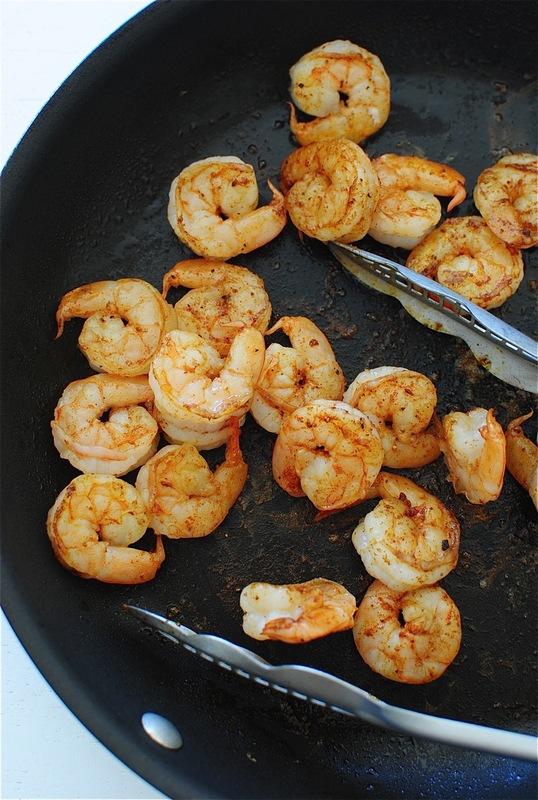 Flip and sear an additional 30 seconds, or until the shrimp is cooked through and you get some good sear marks. In a large food processor, combine the sour cream, Tbs. of ancho chile powder and lime juice. Blitz until smooth and saucy. Warm the tortillas any way you prefer. I like to run them over an open flame on my gas grill to get those good blistered marks on the edges. Double stack (if you want!) 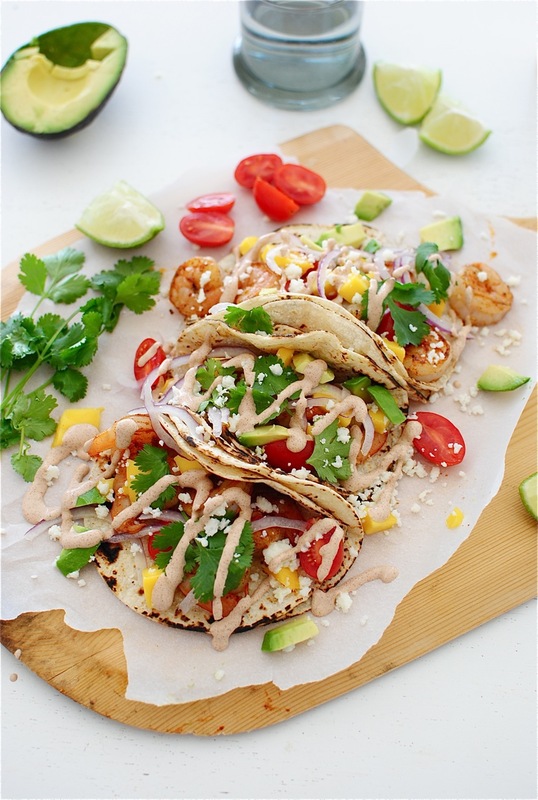 the taco shells, and load up with shrimp, thinly sliced red onion, cherry tomatoes, diced mango, avocado, the queso fresco, cilantro leaves and more lime wedges. Finish with a good drizzle of the sauce over the tacos and devouuuuur. Also, if you feel like being awesome, blister your corn tortillas over an open flame! Boom. *one more thing, working on some ad tweaks, so pardon the ads on the photos. working on that now! Okay I’m done. Off ya go. Your pictures of this recipe are beautiful! So colorful. And the tacos look delicious! Yes, yes I do love queso fresco. And shrimp. And spicy creamy goodness. And margaritas. And lamp. Oh, wait. These are a must have!! As soon as possible. Thanks!! I love the ease and flavor of these tacos! and yes you can say ancho kissed as many times as you want - it just makes me want them more! 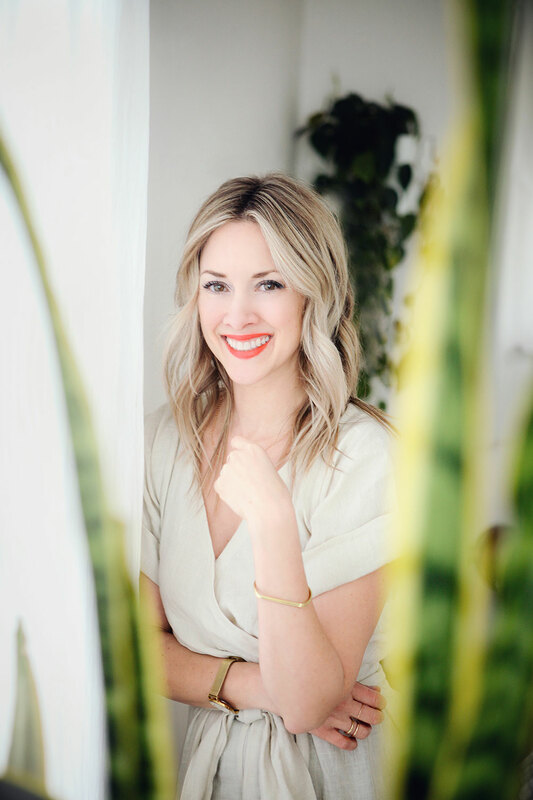 I have been a stalker-non commenting fan of your blog for some time but i wanted to say hi because I am SO EXCITED to see you at Indulge next month! yay! can't wait to meet you! and your twins are ADORBS! Oh awesome!! I can't wait to meet you! Good thing I like ancho because those first few sentences would drive me nuts...Kidding! 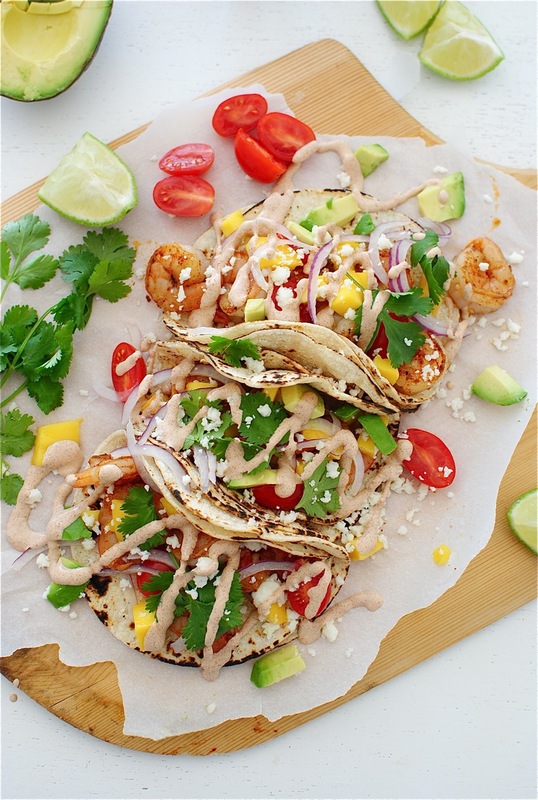 Bring on these shrimp tacos! You can scream at me with shrimp tacos ANYDAY. Your tortillas always look so yummy - I have revisited your fish taco (with pablanos) post more than I care to admit because those tortillas look so amazing. Do you make them yourself or do you have a go-to brand that you care to share? Why thanks! I actually just use anything. I've used Mission before, local brands, the actual grocery store brand, anything corn! Even Trader Joe's has good ones. The trick for me is to turn on my gas burner and place the tortilla on top of the flame (resting on the burner) for 15 seconds. Flip and char the other side for a few seconds, until it looks perfect! But really, any corn tort brand will work! Oh geez these look SO GOOD. I have got to try them. Mmmm Mexican night is one of my fav nights at our house!!! 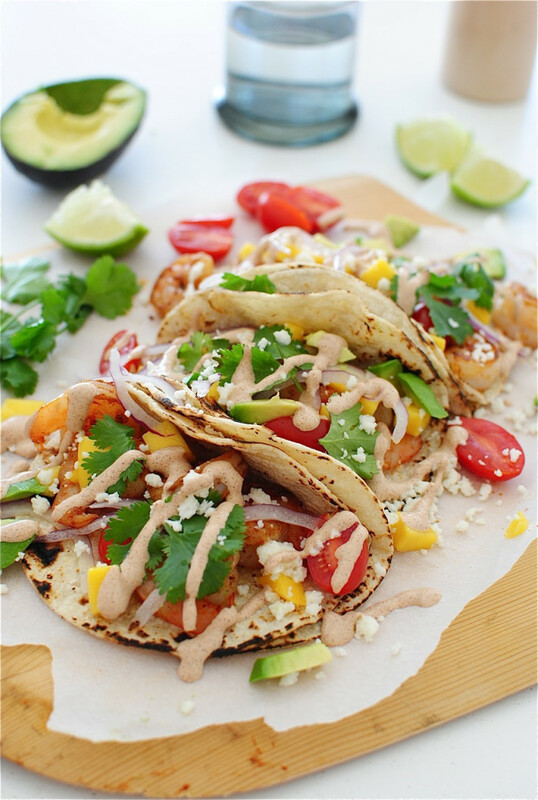 Definitely just saved this recipe... our go-to is usually seared tuna tacos, but these shrimp look mighty fine! These tacos are so delish! It looks really awesome. My friends would love these if I serve it to them so I will make these for our small gathering. Thanks for this! These were so great and perfect for a quick weeknight dinner. I just made and devoured this! Soooo good! Thank you for the inspiration. I "marinaded" in the ancho powder with a little tangerine juice for a few minutes, great tacos! Even Stock images are paid and are often licensed for specific uses but nowadays there are many websites are proving that all similar images for free. Free Stock Images Websites List 2018. Shutterstock, stock Images, Free Download, Shutterstock Images. Fantastic Article to read. I really enjoyed this post. Thak you so much for sharing this. I really Like it. Excellent informative post. Thanks for the services you are providing here,. Visitors who are looking for employment news visit jobrakhi. I can promises you will never get disappointment Thank you! Very nice article. I really liked it. Thanks for sharing this awesome post. Excellent post. very nice article. Very Nice work! I appreciate of your work and knowledge. Please keep writing and sharing updated information with us. Very nice information. Please keep writing and sharing updated information with us.